Football is a major part Thanksgiving for millions of Americans. However, most of us just watch it at home before, during, or after we feast, and can’t imagine giving up turkey, stuffing, cranberries, and pie in favor of hot dogs and overpriced beer. 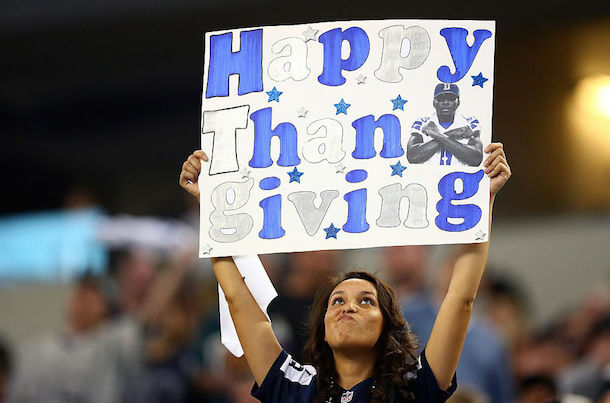 Luckily, Dallas Cowboys fans who want to go to their team’s annual Turkey Day game don’t actually have to give up any of the traditional Thanksgiving foods. In fact, this year they can get them all in one single dish. 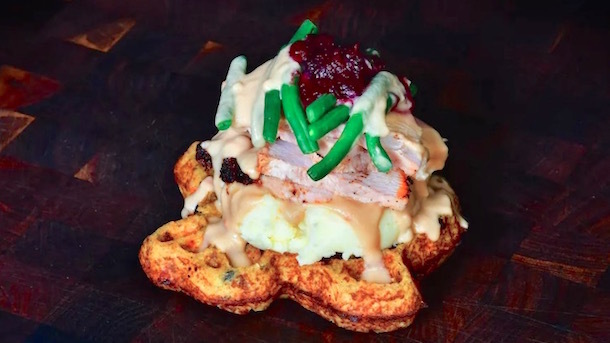 That, dear internet, is a Texas-shaped waffle made out of stuffing, topped with mashed potatoes, gravy, a choice of turkey or ham, green beans, and cranberry sauce. It’s the work of Legends Hospitality, the food-service provider at AT&T Stadium, and it will be available to the 90,000 fans who show up to watch the Dallas Cowboys take on the Los Angeles Chargers on Thursday. No word as to how much it will cost, but you can bet it won’t be cheap. Of course, fans who aren’t interesting in a Texas-shaped Thanksgiving waffle can always opt for a more traditional feast. According to Cowboys blog 5 Points Blue, every year stadium staff cook up 950 whole turkeys, 1500 pounds of ham, 2500 pounds of stuffing, 2000 pounds of mashed potatoes, and 775 pies of various flavors. Texas don’t mess with Thanksgiving.